The A�rospatiale-BAC Concorde was a turbojet-powered supersonic passenger airliner, a supersonic transport (SST). It was a product of an Anglo-French government treaty, combining the manufacturing efforts of A�rospatiale and the British Aircraft Corporation. First flown in 1969, Concorde entered service in 1976 and continued commercial flights for 27 years. Among other destinations, Concorde flew regular transatlantic flights from London Heathrow (British Airways) and Paris-Charles de Gaulle Airport (Air France) to New York JFK, profitably flying these routes at record speeds, in less than half the time of other airliners. Concorde's name reflects the development agreement between the United Kingdom and France. In the UK, any or all of the type-unusual for an aircraft-are known simply as "Concorde". The aircraft is regarded by many as an aviation icon. Picture - Concorde's final flight, G-BOAF from Heathrow to Bristol, on 26 November 2003. The extremely high fineness ratio of the fuselage is evident. In the late 1950s, the United Kingdom, France, United States, and Soviet Union were considering developing supersonic transport. The British Bristol Aeroplane Company and the French Sud Aviation were both working on designs, called the Type 223 and Super-Caravelle, respectively. Both were largely funded by their respective governments. The British design was for a thin-winged delta shape (which owed much to work by Dietrich Kx�chemann) for a transatlantic-ranged aircraft for about 100 people, while the French were intending to build a medium-range aircraft. The designs were both ready to start prototype construction in the early 1960s, but the cost was so great that the British government made it a requirement that BAC look for international co-operation. Approaches were made to a number of countries, but only France showed real interest. The development project was negotiated as an international treaty between the two countries rather than a commercial agreement between companies and included a clause, originally asked for by the UK, imposing heavy penalties for cancellation. A draft treaty was signed on 28 November 1962. By this time, both companies had been merged into new ones; thus, the Concorde project was between the British Aircraft Corporation and A�rospatiale. At first the new consortium intended to produce one long range and one short range version. However, prospective customers showed no interest in the short-range version and it was dropped. The consortium secured orders (i.e., non-binding options) for over 100 of the long-range version from the major airlines of the day: Pan Am, BOAC and Air France were the launch customers, with six Concordes each. Other airlines in the order book included Panair do Brasil, Continental Airlines, Japan Airlines, Lufthansa, American Airlines, United Airlines, Air India, Air Canada, Braniff, Singapore Airlines, Iran Air, Olympic Airways, Qantas, CAAC, Middle East Airlines and TWA. Reflecting the treaty between the British and French governments which led to Concorde's construction, the name Concorde is from the French word concorde (IPA: [kɔ̃kɔʁd]), which has an English cognate, concord (IPA: /ˈkɒŋkɔrd/). Both words mean agreement, harmony or union. The aircraft was initially referred to in the UK as Concorde, with the French spelling, but was officially changed to Concord by Harold Macmillan in response to a perceived slight by Charles de Gaulle. In 1967, at the French roll-out in Toulouse the British Government Minister for Technology, Tony Benn announced that he would change the spelling back to Concorde. This created a nationalist uproar that died down when Benn stated that the suffixed ‹e› represented "Excellence, England, Europe and Entente (Cordiale)." In his memoirs, he recounts a tale of a letter from an irate Scotsman claiming: "[Y]ou talk about 'E' for England, but part of it is made in Scotland." Given Scotland’s contribution of providing the nose cone for the aircraft, Benn replied, "[I]t was also 'E' for 'x�cosse' (the French name for Scotland) - and I might have added 'e' for extravagance and 'e' for escalation as well!" Concorde also acquired an unusual nomenclature for an aircraft. In common usage in the United Kingdom, the type is known as Concorde (without an article) rather than the Concorde or a Concorde. Picture - Pre-production Concorde 101 on display at the Imperial War Museum Duxford, UK. Construction of two prototypes began in February 1965: 001, built by Aerospatiale at Toulouse, and 002, by BAC at Filton, Bristol. Concorde 001 made its first test flight from Toulouse on 2 March 1969, piloted by Andr� Turcat, and first went supersonic on 1 October. The first UK-built Concorde flew from Filton to RAF Fairford on 9 April 1969, piloted by Brian Trubshaw. Both prototypes were presented to the public for the first time on 7-8 June 1969 at the Paris Airshow. As the flight programme progressed, 001 embarked on a sales and demonstration tour on 4 September 1971, which was also the first transatlantic crossing of Concorde. Concorde 002 followed suit on 2 June 1972 with a tour of the Middle and Far East. Concorde 002 made the first visit to the United States in 1973, landing at the new Dallas/Fort Worth Regional Airport to mark that airport’s opening. These trips led to orders for over 70 aircraft, but a combination of factors led to order cancellations: the 1973 oil crisis, financial difficulties of airlines, a spectacular Paris Le Bourget air show crash of the competing Soviet Tupolev Tu-144, and environmental concerns such as the sonic boom, takeoff-noise and pollution. By 1976 four nations remained as prospective buyers: Britain, France, China, and Iran. In the end only Air France and British Airways (the successor to BOAC) took up their orders, with the two governments taking a cut of any profits made. In the case of BA, 80% of the profit was kept by the government until 1984, while the cost of buying the aircraft was covered by a state loan. Picture - Concorde G-BOAB in storage at London Heathrow Airport following the end of all Concorde flying. This aircraft flew for 22,296 hours between its first flight in 1976 and its final flight in 2000. The United States cancelled the Boeing 2707, its supersonic transport programme, in 1971. Industry observers in France and the United Kingdom suggested that part of the American opposition to Concorde on grounds of noise pollution was orchestrated, or at least encouraged, by the United States Government, out of spite at not being able to propose a viable competitor, despite President John F. Kennedy's impassioned 1963 statement of commitment. Other countries, such as India and Malaysia, ruled out Concorde supersonic overflights stating noise concerns. Demonstration and test flights were flown from 1974 onwards. The testing of Concorde set records that have not been surpassed; the prototype, pre-production and first production aircraft undertook 5,335 flight hours; 2,000 test hours were at supersonic speeds. During one such test flight, on 7th of November 1974, 001 performed the fastest civil flight across the North Atlantic, record still valid today. Unit costs were �23 million (US$46 million) in 1977, and development costs were six times the projected amount. Lack of an auxiliary power unit, as Concorde would only visit large airports where a ground air start cart would be available. Picture - G-AXDN, Duxford, close up of pre-production engine nozzles. The nozzle/thrust reverser design was altered for the production Concordes. To be economically viable, Concorde needed to be able to fly long distances, and this required high efficiency. For optimum supersonic flight, turbofan engines were considered, but rejected, due to their larger cross-section which would cause excessive drag. Turbojets were found to be the best choice of engines. The engine developed was the twin spool Rolls-Royce/Snecma Olympus 593, a development of the Bristol engine first used for the Avro Vulcan bomber, and developed into an afterburning supersonic variant for the BAC TSR-2 strike bomber. The intake design for Concorde’s engines was critical. All conventional jet engines can take in air at only around Mach 0.5; therefore the air has to be slowed from the Mach 2.0 airspeed that enters the engine intake. In particular, Concorde needed to control the shock waves that this reduction in speed generates to avoid damage to the engines. This was done by a pair of intake ramps and an auxiliary spill door, whose position was moved during flight to slow the air down. The ramps were at the top of the engine compartment and moved down and the auxiliary spill door moved both up and down allowing air to flow in or out. The effectiveness of the intake system is such that, during supersonic flight, 63% of the aircraft's thrust is attributed to the intakes whilst the exhaust nozzles generate 29% and the engines just 8% of the thrust. Engine failure causes problems on conventional subsonic aircraft; not only does the aircraft lose thrust on that side but the engine creates drag, causing the aircraft to yaw and bank in the direction of the failed engine. If this had happened to Concorde at supersonic speeds, it could theoretically cause a catastrophic failure of the airframe. 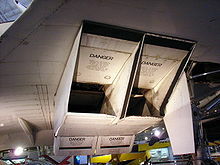 However, during an engine failure, air intake needs are virtually zero, so in Concorde, the immediate effects of the engine failure were countered by the opening of the auxiliary spill door and the full extension of the ramps, which deflected the air downwards past the engine, gaining lift and streamlining the engine, minimising the drag effects of the failed engine. Although computer simulations predicted considerable difficulties, in practice Concorde was able to shut down both engines on the same side of the aircraft at Mach 2 without any of the predicted control problems. Concorde pilots were routinely trained in simulators to deal with a double engine failure. The aircraft used reheat (afterburners) at takeoff and to pass through the transonic regime (i.e., "go supersonic") between Mach 0.95 and Mach 1.7, and were switched off at all other times. Due to jet engines being highly inefficient at low speeds, Concorde burned two tonnes of fuel (almost 2% of the maximum fuel load) taxiing to the runway. To conserve fuel only the two outer engines were run after landing. The thrust from two engines was sufficient for taxiing to the ramp due to low aircraft weight upon landing at its destination. Beside engines, the hottest part of the structure of any supersonic aircraft is the nose. The engineers wanted to use duralumin, an aluminium alloy, throughout the aircraft due to its familiarity, cost and ease of construction. The highest temperature that aluminium could sustain over the life of the aircraft was 127 �C, which limited the top speed to Mach 2.02. Concorde went through two cycles of heating and cooling during a flight, first cooling down as it gained altitude, then heating up after going supersonic. The reverse happened when descending and slowing down. This had to be factored into the metallurgical modelling. A test rig was built that repeatedly heated up a full-size section of the wing, and then cooled it, and periodically samples of metal were taken for testing. Owing to the heat generated by compression of air as Concorde travelled supersonically, the fuselage would extend by as much as 300 mm (almost 1 ft), the most obvious manifestation of this being a gap that opened up on the flight deck between the flight engineer’s console and the bulkhead. On all Concordes that had a supersonic retirement flight, the flight engineers placed their hats in this gap before it cooled, where the hats remain to this day. To keep the cabin cool, Concorde used the fuel as a heat sink for the heat from the air conditioning, the same method also cooled the hydraulics. During supersonic flight the surfaces forward from the cockpit became heated, a visor was used to deflect much of this heat from directly reaching the cockpit. Concorde also had restrictions on livery; the majority of the surface had to be painted with a highly reflective white paint to avoid overheating the aluminium structure due to heating effects from supersonic flight at Mach 2. In 1996, however, Air France briefly painted F-BTSD in a predominantly blue livery (with the exception of the wings) as part of a promotional deal with Pepsi Cola. In this paint scheme, Air France were advised to remain at Mach 2 for no more than 20 minutes at a time, but there was no restriction at speeds under Mach 1.7. F-BTSD was chosen for the promotion because the aircraft was not then scheduled to operate any long flights that required extended Mach 2 operations. Due to the high speeds at which Concorde travelled, large forces were applied to the aircraft's structure during banks and turns. This caused twisting and the distortion of the aircraft’s structure. In addition there were concerns over maintaining precise control at supersonic speeds; both of these issues were resolved by active ratio changes between the inboard and outboard elevons, varying at differing speeds including supersonic. Only the innermost elevons, which are attached to the stiffest area of the wings, are active at high speed. Additionally, the narrow fuselage meant that the aircraft flexed. This was visible from the rear passengers’ viewpoints. Due to a high average takeoff speed of 250 miles per hour (400 km/h), Concorde needed upgraded brakes. Like most airliners, Concorde has anti-skid braking - a system which prevents the tyres from losing traction when the brakes are applied for greater control during roll-out. The brakes, developed by Dunlop, were the first carbon-based brakes used on an airliner. They could bring Concorde to a stop from an aborted takeoff within one mile (1600 m) when weighing up to 185 tons (188 tonnes) and travelling at 190 miles per hour (310 km/h). This braking manoeuvre brought the brakes to temperatures of 300-500 �C, requiring several hours for cooling. Another issue uncovered during development was the undercarriage. Because of the way Concorde's delta-wing generated lift, the undercarriage had to be unusually strong. 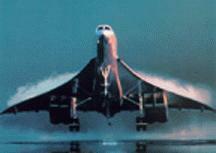 At rotation, Concorde would rise to a high angle of attack, about 18 degrees. Prior to rotation the wing generated almost no lift, unlike typical aircraft wings. Combined with the high airspeed at rotation (199 KIAS), this unexpectedly increased the stresses on the rear undercarriage and during the development required a major redesign. Due to the high alpha needed at rotation, a small set of wheels were added aft to prevent tailstrikes. The rear main undercarriage units swing towards each other to be stowed but due to their great height also need to retract telescopically before swinging in order to clear each other when stowed. Concorde needed to travel between London and New York, or Washington, non-stop, and to achieve this the designers gave Concorde the greatest supersonic range of any aircraft. This was achieved by a combination of careful development of the engines to make them highly efficient at supersonic speeds (actually the world's most energy-efficient jet engine), by using a slender fuselage, and very careful design of the wing shape to give a good lift to drag ratio, by having a modest payload and high fuel capacity, and by moving the fuel to trim the aircraft without introducing any additional drag. Nevertheless, soon after Concorde began flying, a Concorde "B" model was designed with slightly larger fuel capacity and slightly larger wings with leading edge slats to improve aerodynamic performance at all speeds. It featured more powerful engines with sound deadening and without the fuel-hungry and noisy reheat. It was speculated that it was reasonably possible to create an engine with up to 25% gain in efficiency over the Rolls-Royce/Snecma Olympus 593. This would have given 500 mi (805 km) additional range even with greater payload, and would have made new commercial routes possible. This was cancelled due in part to poor sales of Concorde, but also to the rising cost of aviation fuel in the 1970s. The high altitude at which Concorde cruised meant passengers received almost twice the flux of extraterrestrial ionising radiation as those travelling on a conventional long-haul flight. Upon Concorde's introduction, it was speculated that this exposure during supersonic travels would increase the likelihood of skin cancer. However, due to the proportionally reduced flight time, the overall equivalent dose would normally be less than a conventional flight over the same distance. Unusual solar activity might lead to an increase in incident radiation. To prevent incidents of excessive radiation exposure the flight deck had a radiometer and an instrument to measure the rate of decrease of radiation. If the radiation level became too high, Concorde would descend below 47,000 feet (14,000 m). Picture - British Airways Concorde interior before 2000. The narrow fuselage needed for efficient supersonic flight permitted only 4 seats across the aircraft, and gave limited headroom and locker space. Airliner cabins were usually maintained at a pressure equivalent to 6,000-8,000 feet (1,800-2,400 m) elevation. Concorde’s pressurisation was set to an altitude at the lower end of this range, 6,000 feet (1,800 m). Concorde’s maximum cruising altitude was 60,000 feet (18,000 m); subsonic airliners typically cruise below 40,000 feet (12,000 m). Above 50,000 feet (15,000 m), the lack of air pressure would give a "time of useful consciousness" in even a conditioned athlete of no more than 10-15 seconds. A sudden reduction in cabin pressure is hazardous to all passengers and crew. At Concorde’s altitude, the air density is very low; a breach of cabin integrity would result in a loss of pressure severe enough so that the plastic emergency oxygen masks installed on other passenger jets would not be effective, and passengers would quickly suffer from hypoxia despite quickly donning them. 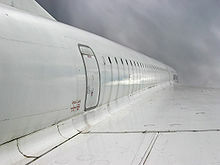 Concorde, therefore, was equipped with smaller windows to reduce the rate of loss in the event of a breach, a reserve air supply system to augment cabin air pressure, and a rapid descent procedure to bring the aircraft to a safe altitude. The FAA enforces minimum emergency descent rates for aircraft and made note of Concorde’s higher operating altitude, concluding that the best response to a loss of pressure would be a rapid descent. Pilots had access to Continuous Positive Airway Pressure (CPAP) which used masks that forced oxygen at higher pressure into the crew’s lungs. Picture - Concorde with droop nose in fully down position during rollout after landing. Concorde’s drooping nose was a compromise between the need for a streamlined design to reduce drag and increase aerodynamic efficiency in flight and the need for the pilot to see properly during taxi, takeoff, and landing operations. 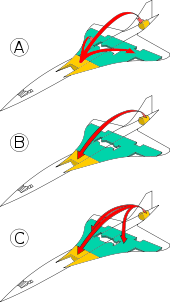 A delta-wing aircraft takes off and lands with a high angle of attack (a high nose angle) compared to other wing planforms, due to the way the delta wing generates lift. The pointed nose would obstruct the pilots’ view of taxiways and runways, so Concorde’s nose was designed to allow for different positioning for different operations. The droop nose was accompanied by a moving visor that was retracted into the nose prior to the nose being lowered. When the nose was raised back to horizontal, the visor was raised ahead of the front cockpit windscreen for aerodynamic streamlining in flight. A controller in the cockpit allowed the visor to be retracted and the nose to be lowered to 5� below the standard horizontal position for taxiing and takeoff. Following takeoff and after clearing the airport, the nose and visor were raised. Shortly before landing, the visor was again retracted and the nose lowered to 12.5� below horizontal for maximum visibility. Upon landing, the nose was raised to the five-degree position to avoid the possibility of damage. On rare occasions, the aircraft could take off with the nose fully down. A final position had the visor retracted into the nose but the nose in the standard horizontal position. This setup was used for cleaning the windscreen and for short subsonic flights. The two prototype Concordes had two fixed "glass holes" on their retractable visors. The US Federal Aviation Administration objected to that restrictive visibility and demanded a different design before it would permit Concorde to serve US airports, which led to the redesigned visor used on the production aircraft and the four "pre-production" aircraft (101, 102, 201, and 202). While commercial jets take eight hours to fly from New York to Paris, the average supersonic flight time on the transatlantic routes was just under 3.5 hours. Concorde had a maximum cruise altitude of 18,300 metres (60,039 ft) and an average cruise speed of Mach 2.02, about 1155 knots (2140 km/h or 1334 mph), more than twice the speed of conventional aircraft. With no other civil traffic operating at its cruising altitude of about 56,000 ft (17,000 m), dedicated oceanic airways or "tracks" were used by Concorde to cross the Atlantic. Due to the nature of high altitude winds, these SST tracks were fixed in terms of their co-ordinates, unlike the North Atlantic Tracks at lower altitudes whose co-ordinates alter daily according to forecast weather patterns. Concorde would also be cleared in a 15,000-foot (4,600 m) block, allowing for a slow climb from 45,000 to 60,000 ft (18,000 m) during the oceanic crossing as the fuel load gradually decreased. In regular service, Concorde employed an efficient cruise-climb flight profile following take-off. During a landing approach Concorde was on the "back side" of the drag force curve, where raising the nose would increase the sink rate. The delta-shaped wings allowed Concorde to attain a higher angle of attack than conventional aircraft, as it allowed the formation of large low pressure vortices over the entire upper wing surface, maintaining lift. The normal landing speed was 170 miles per hour (274 km/h). BA flights flown by Concorde added "Concorde" in addition to the standard "Speedbird" callsign to notify air traffic control of the aircraft’s unique abilities and restrictions. Scheduled flights began on 21 January 1976 on the London-Bahrain and Paris-Rio (via Dakar) routes. The Paris-Caracas route (via Azores) began on 10 April of the same year. 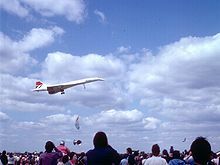 The US Congress had just banned Concorde landings in the US, mainly due to citizen protest over sonic booms, preventing launch on the coveted transatlantic routes. However, the US Secretary of Transportation, William Coleman, gave permission for Concorde service to Washington Dulles International Airport, and Air France and British Airways simultaneously began service to Dulles on 24 May 1976. In 1977, British Airways and Singapore Airlines shared a Concorde for flights between London and Singapore International Airport via Bahrain. The aircraft, BA’s Concorde G-BOAD, was painted in Singapore Airlines livery on the port side and British Airways livery on the starboard side. The service was discontinued after three return flights because of noise complaints from the Malaysian government; it could only be reinstated on a new route bypassing Malaysian airspace in 1979. A dispute with India prevented Concorde from reaching supersonic speeds in Indian airspace, so the route was eventually declared not viable and discontinued in 1980. During the Mexican oil boom, Air France flew Concorde twice weekly to Mexico City’s Benito Jux�rez International Airport via Washington, DC, or New York City, from September 1978 to November 1982. The worldwide economic crisis during that period resulted in this route’s cancellation; the last flights were almost empty. The routing between Washington or New York and Mexico City included a deceleration, from Mach 2.02 to Mach 0.95, to cross Florida subsonically and avoid unlawfully creating a sonic boom over the state; Concorde then re-accelerated back to its original speed to cross the Gulf of Mexico. On 1 April 1989, on an around-the-world luxury tour charter, British Airways implemented a new version of this routing that allowed G-BOAF to maintain Mach 2.02 by passing around Florida to the east and south. From time to time, Concorde came back to the region on similar chartered flights to Mexico City and Acapulco. From 1978 to 1980, Braniff International Airways leased 10 Concordes, five each from Air France and British Airways. These were used on subsonic flights between Dallas-Fort Worth and Washington Dulles International Airport, flown by Braniff flight crews. Air France and British Airways crews then took over for the continuing supersonic flights to London and Paris. The aircraft were registered in both the United States and their home countries; the European registration was covered for the hours it was being operated by Braniff, retaining the full AF/BA liveries. The flights were not profitable and were usually less than 50% booked, forcing Braniff to end its tenure as the only US Concorde operator in May 1980. By around 1981 in the UK, the future for Concorde looked bleak. 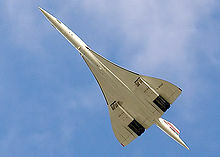 The British government had lost money operating Concorde every year, and moves were afoot to cancel the service entirely. A cost projection came back with greatly reduced metallurgical testing costs because the test rig for the wings had built up enough data to last for 30 years and could be shut down. Despite this, the government was not keen to continue. In late 1983, the managing director of BA, Sir John King, convinced the government to sell the aircraft outright to (the then state owned, later privatised) BA for �16.5 million plus the first year’s profits. Sir John King realised that he had a premier product that was underpriced, and after carrying out a market survey, British Airways discovered that their target customers thought that Concorde was more expensive than it actually was. They progressively raised prices and service quality to match these perceptions. It is reported that British Airways then ran Concorde at a profit, unlike their French counterpart. British Airways's profits have been reported to be up to �50 million in the most profitable years, with a total revenue of �1.75 billion, before costs of �1 billion. Between 1984 and 1991, British Airways flew a thrice-weekly Concorde service between London and Miami, stopping at Washington’s Dulles International Airport. Until 2003, Air France and British Airways continued to operate the New York services daily. Concorde also visited Barbados’s Grantley Adams International Airport during the winter holiday season. Until the Air France Paris crash ended virtually all charter services by both AF and BA, several UK and French tour operators operated charter flights to European destinations on a regular basis; the charter business was viewed as lucrative by British Airways and Air France. On 25 July 2000, Air France Flight 4590, registration F-BTSC, crashed in Gonesse, France, killing all 100 passengers and nine crew members on board the flight, and four people on the ground. It was the only fatal incident involving Concorde. According to the official investigation conducted by the French accident investigation bureau (BEA), the crash was caused by a titanium strip that fell from a Continental Airlines DC-10 that had taken off minutes earlier. This metal fragment punctured a tyre on the Concorde's left main wheel bogie during takeoff. The tyre exploded, a piece of rubber hit the fuel tank, and while the fuel tank was not punctured, the impact caused a shock-wave which caused one of the fuel valves in the wing to burst open. This caused a major fuel leak from the tank, which then ignited due to sparking electrical landing gear wiring severed by another piece of the same tyre. The crew shut down engine number 2 in response to a fire warning, and with engine number 1 surging and producing little power, the aircraft was unable to gain height or speed. The aircraft entered a rapid pitch-up then a violent descent, rolling left and crashing tail-low into the Hotelissimo Hotel in Gonesse. On 6 December 2010, Continental Airlines and John Taylor, one of their mechanics, were found guilty of involuntary manslaughter. Prior to the accident, Concorde had been arguably the safest operational passenger airliner in the world in terms of passenger deaths-per-kilometres travelled with zero, but with a history of tyre explosions 60 times higher than subsonic jets. Safety improvements were made in the wake of the crash, including more secure electrical controls, Kevlar lining to the fuel tanks and specially developed burst-resistant tyres. The first flight after the modifications departed from London Heathrow on 17 July 2001, piloted by BA Chief Concorde Pilot Mike Bannister. During the 3-hour 20-minute flight over the mid-Atlantic towards Iceland, Bannister attained Mach 2.02 and 60,000 ft (18,000 m) before returning to RAF Brize Norton. The test flight, intended to resemble the London-New York route, was declared a success and was watched on live TV, and by crowds on the ground at both locations. Another BA assessment flight carrying passengers took place on 11 September 2001, and landed just before the 11 September 2001 attacks in the United States. This was not a revenue flight, as all the passengers were BA employees. Normal commercial operations resumed on 7 November 2001 by BA and AF (aircraft G-BOAE and F-BTSD), with service to New York JFK, where passengers were welcomed by the mayor Rudy Giuliani. On 10 April 2003, Air France and British Airways simultaneously announced that they would retire Concorde later that year. They cited low passenger numbers following 25 July 2000 crash, economic effects and the slump in air travel following 11 September 2001, and rising maintenance costs. 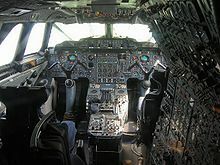 Although Concorde was a technological marvel when introduced into service in the 1970s, 30 years later its cockpit, cluttered with analogue controls and dials, looked dated, as there had been little commercial pressure or reason to upgrade Concorde due to a lack of competing aircraft, unlike other airliners of the same vintage, for example the Boeing 747. By its retirement, it was the last aircraft in British Airways' fleet that still had a flight engineer; other aircraft, such as the modernised 747-400, had eliminated that role. On the same day, Sir Richard Branson offered to buy British Airways’ Concorde fleet at their "original price of �1" for service with his Virgin Atlantic Airways. Branson claimed this to be the same token price that British Airways had paid the British Government, but BA denied this and refused the offer. The real cost of buying the aircraft was �26 million each but the money for buying the aircraft was lent by the government (which in turn took 80% of the profits). Subsequently BA bought two aircraft for a book value of �1 as part of the �16.5 million buy out in 1983. Branson wrote in The Economist (23 October 2003) that his final offer was "over �5 million" and that he had intended to operate the fleet "for many years to come". Any hope of Concorde remaining in service was further thwarted by Airbus's unwillingness to provide maintenance support for the aging airframes. It has been suggested that Concorde was not withdrawn for the reasons usually given, but that it became apparent during the grounding of Concorde to the airlines that they could make more revenue carrying first class passengers subsonically. Rob Lewis suggested that the Air France retirement of its Concorde fleet was the result of a conspiracy between Air France Chairman Jean-Cyril Spinetta and Airbus CEO Noel Forgeard, and stemmed as much from a fear of being found criminally liable under French law for future AF Concorde accidents as from simple economics. On the British Airways side, a lack of commitment to Concorde by then-Director of Engineering Alan MacDonald was cited as undermining BA’s resolve to continue operating Concorde from within. Air France made its final commercial Concorde landing in the United States in New York City from Paris on 30 May 2003. During the following week, on 2 June and 3 June 2003, F-BTSD flew a final round-trip from Paris to New York and back for airline staff and long-time employees in the airline's Concorde operations. Air France's final Concorde flight took place on 27 June 2003 when F-BVFC retired to Toulouse. An auction of Concorde parts and memorabilia for Air France was held at Christie's in Paris on 15 November 2003; thirteen hundred people attended, and several lots exceeded their predicted values. French Concorde F-BVFC was retired to Toulouse and kept functional after the end of service, including engine runs, for a short while, in case taxi runs were required in support of the French judicial enquiry into the 2000 crash. The aircraft is now fully retired and no longer functional. French Concorde F-BTSD has been retired to the "Mus�e de l'Air et de l'Espace" at Le Bourget (near Paris) and, unlike the other museum Concordes, a few of the systems are being kept functional, so that, for instance, the famous "droop nose" can still be lowered and raised. This led to rumours that they could be prepared for future flights for special occasions. French Concorde F-BVFB currently rests at the Auto & Technik Museum Sinsheim at Sinsheim, Germany, after its last flight from Paris to Baden-Baden, followed by a spectacular transport to Sinsheim via barge and road. The museum also has a Tu-144 on display - this is the only place where both supersonic airliners can be seen together. British Airways conducted a North American farewell tour in October 2003. G-BOAG visited Toronto Pearson International Airport on 1 October 2003, after which it flew to New York’s John F. Kennedy International Airport as part of the tour. G-BOAD visited Boston’s Logan International Airport on 8 October 2003, and G-BOAG visited Washington Dulles International Airport on 14 October 2003. Misleading claims were made that G-BOAD’s flight to Boston set a record for the fastest transatlantic flight from east to west, making the trip from London Heathrow in 3 hours, 5 minutes, 34 seconds. However the fastest transatlantic flight was from London Heathrow to New York JFK airport on 7 February 1996 which took 2 hours, 52 minutes, 59 seconds from takeoff to touchdown. This flight was also made by G-BOAD. On 22 October, Heathrow ATC arranged for the inbound flight BA9021C, a special from Manchester, and BA002 from New York to land simultaneously on the left and right runways respectively. On the evening of 23 October 2003, the Queen consented to the illumination of Windsor Castle as Concorde's last west-bound commercial flight departed London overhead, an honour normally reserved for major state events and visiting dignitaries. British Airways retired its Concorde fleet on 24 October. G-BOAG left New York to a fanfare similar to that given for Air France’s F-BTSD, while two more made round trips, G-BOAF over the Bay of Biscay, carrying VIP guests including former Concorde pilots, and G-BOAE to Edinburgh. The three aircraft then circled over London, having received special permission to fly at low altitude, before landing in sequence at Heathrow. All three aircraft spent 45 minutes taxiing around the airport before disembarking the last supersonic fare-paying passengers. The captain of the New York to London flight was Mike Bannister. G-BOAE (212) took its retirement flight on 17 November 2003 from Heathrow to Grantley Adams International Airport on Barbados, where the plane can still be seen daily. All of BA's Concorde fleet have been grounded,drained of hydraulic fluid and their airworthiness certificates withdrawn . Jock Lowe, ex-chief Concorde pilot and manager of the fleet estimated in 2004 that it would cost �10-15 million to make G-BOAF airworthy again. BA maintain ownership and have stated that they will not fly again as Airbus ended support of the aircraft in 2003. On 1 December 2003, Bonhams held an auction of British Airways’ Concorde artefacts, including a nose cone, at Kensington Olympia in London. Proceeds of around �750,000 were raised, with the majority going to charity. In March 2007, BA announced they would not renew their contract for the prime advertising spot at the entrance to Heathrow Airport where, since 1990, a 40% scale model of Concorde was located. The Concorde model was removed and placed on display at the Brooklands Museum. One of the youngest Concordes (F-BTSD) is on display at Le Bourget Air and Space Museum in Paris. In February 2010, it was announced that the museum and a group of volunteer Air France technicians intend to restore F-BTSD so it can taxi under its own power. On 29 May 2010, it was reported that a group comprising the British Save Concorde Group and the French Olympus 593 had begun work on inspecting the engines of a Concorde at Le Bourget Air and Space Museum, with the intent to restore the plane to be able to fly again in demonstrations and air shows. Flying in the opening ceremony for the 2012 London Olympics is also a goal. 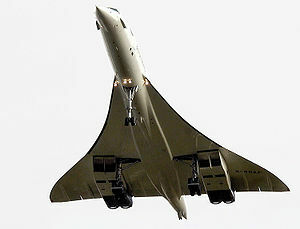 Prior to Concorde’s flight trials, the developments made by the civil aviation industry were largely accepted by governments and their respective electorates. The opposition to Concorde’s noise, particularly on the eastern coast of the United States, forged a new political agenda on both sides of the Atlantic, with scientists and technology experts across a multitude of industries beginning to take the environmental and social impact more seriously. Although Concorde led directly to the introduction of a general noise abatement programme for aircraft flying out of John F. Kennedy Airport, many found that Concorde was quieter than expected, partly due to the pilots temporarily throttling back their engines to reduce noise during overflight of residential areas. Even before the launch of revenue earning services, it had been noted that Concorde was quieter than several aircraft already commonly in service at that time. Concorde’s technical leap forward boosted the public’s understanding of conflicts between technology and the environment as well as the awareness of the complex decision analysis processes that surround such conflicts. In France, the use of acoustic fencing alongside TGV tracks might not have been achieved without the 1970s controversy over aircraft noise. In the UK, the CPRE have issued tranquillity maps since 1990. Concorde was normally perceived as a privilege of the rich, but special circular or one-way (with return by other flight or ship) charter flights were arranged to bring a trip within the means of moderately well-off enthusiasts. It is a symbol of great national pride to many in the UK and France; in France it was thought of as a French aircraft, in the UK as British. The aircraft was usually referred to by the British as simply "Concorde", whilst in France it was known as "le Concorde" due to "le", the definite article, being used in French grammar to introduce the name of a ship or aircraft, and the capital being used to distinguish a proper name from a common noun of the same spelling. In French, the common noun concorde means "agreement, harmony, or peace", Concorde’s pilots and British Airways in official publications and videos often refer to Concorde both in the singular and plural as "she" or "her". As a symbol of national pride, an example from the BA fleet made occasional flypasts at selected Royal events, major air shows and other special occasions, sometimes in formation with the Red Arrows. On the final day of commercial service, public interest was so great that grandstands were erected at London’s Heathrow Airport to afford a view of the final arrivals. Crowds filled the boundary road around the airport and there was extensive media coverage. Thirty-seven years after her first test flight, Concorde was announced the winner of the Great British Design Quest organised by the BBC and the Design Museum. A total of 212,000 votes were cast with Concorde beating design icons such as the Mini, mini skirt, Jaguar E-type, Tube map and the Supermarine Spitfire. The fastest transatlantic airliner flight was from London Heathrow to New York JFK on 7 February 1996 by British Airways' G-BOAD in 2 hours, 52 minutes, 59 seconds from takeoff to touchdown. Concorde also set other records, including the official FAI "Westbound Around the World" and "Eastbound Around the World" world air speed records. On 12-13 October 1992, in commemoration of the 500th anniversary of Columbus’ first New World landing, Concorde Spirit Tours (USA) chartered Air France Concorde F-BTSD and circumnavigated the world in 32 hours 49 minutes and 3 seconds, from Lisbon, Portugal, including six refuelling stops at Santo Domingo, Acapulco, Honolulu, Guam, Bangkok, and Bahrain. The eastbound record was set by the same Air France Concorde (F-BTSD) under charter to Concorde Spirit Tours in the USA on 15-16 August 1995. This promotional flight circumnavigated the world from New York/JFK International Airport in 31 hours 27 minutes 49 seconds, including six refuelling stops at Toulouse, Dubai, Bangkok, Andersen AFB in Guam, Honolulu, and Acapulco. By its 30th flight anniversary on 2 March 1999 Concorde had clocked up 920,000 flight hours, with more than 600,000 supersonic, much more than all of the other supersonic aircraft in the Western world combined. The only other supersonic airliner in direct competition with Concorde was the Soviet Tupolev Tu-144, which was nicknamed "Concordski" by Western Europeans for its outward similarity to Concorde. Soviet espionage efforts had resulted in the theft of Concorde blueprints, ostensibly to assist in the design of the Tu-144. As a result of a rushed development programme, the first prototype of the Tu-144 was substantially different from the preproduction machines, but both were cruder and less refined than Concorde. The Tu-144S had a significantly shorter range than Concorde, due to its low-bypass turbofan engines. The vehicle had poor control at low speeds because of a simpler supersonic wing design; in addition the Tu-144 required parachutes to land while Concorde had sophisticated anti-lock brakes. The Tu-144 had two crashes, one at the 1973 Paris Air Show, and another during a pre-delivery test flight in the summer of 1978. Later production versions had retractable canards for better low-speed control, and a 126-seat research version used turbojet engines that gave them nearly the fuel efficiency and similar range to Concorde. With a top speed of Mach 2.35 it was potentially a more competitive aircraft - but was quickly taken out of service due to severe safety defects. The American designs, the Boeing 2707 and the Lockheed L-2000 were to have been larger, with seating for up to 300 people. Running a few years behind Concorde, the winning Boeing 2707 was redesigned to a cropped delta layout; the extra cost of these changes helped to kill the project. The operation of US military aircraft such as the XB-70 Valkyrie and B-58 Hustler had shown that sonic booms were quite capable of reaching the ground, and the experience from the Oklahoma City sonic boom tests led to the same environmental concerns that hindered the commercial success of Concorde. The American government cancelled the project in 1971, after having spent more than $1 billion. The only other large supersonic aircraft comparable to Concorde are strategic bombers, principally the Russian Tupolev Tu-22/Tu-22M and Tu-160 and the American B-1B Lancer. The desire for a second-generation supersonic aircraft has remained within some elements of the aviation industry, and several concepts emerged quickly following the retirement of Concorde. In November 2003, EADS-the parent company of the Airbus aircraft manufacturing company-announced that it was considering working with Japanese companies to develop a larger, faster replacement for Concorde. In October 2005, JAXA, the Japan Aerospace eXploration Agency, undertook aerodynamic testing of a scale model of an airliner designed to carry 300 passengers at Mach 2 (working name NEXST). If pursued to commercial deployment, it would be expected to be in service around 2020-2025. The British company Reaction Engines Limited, with 50% EU money, has been engaged in a research programme called LAPCAT, which examined a design for a hydrogen-fuelled plane carrying 300 passengers called the A2, potentially capable of flying at Mach 5+ non-stop from Brussels to Sydney in 4.6 hours. The follow-on research effort, LAPCAT II began in 2008 and is to last four years. In May 2008, it was reported that Aerion Corporation had $3 billion of pre-order sales on its Aerion SBJ supersonic business jet. In late 2010, the project continued with a testbed flight of a section of the wing. .
Supersonic Aerospace International's Quiet Supersonic Transport was a 12 passenger design from Lockheed Martin that was to cruise at Mach 1.6, and was to have created a sonic boom only 1% as strong as that generated by Concorde. Barfiel, Norman (1974). "A�rospatiale/BAC Concorde". Aircraft in Profile, Volume 14. Berkshire, UK: Profile Publications Ltd. pp. 73-113. ISBN 0-85383-023-1. Calvert, Brian (2002). Flying Concorde: The Full Story. London: Crowood Press. ISBN 1-84037-352-0. Deregel, Xavier; Jean-Philippe Lemaire (2009). Concorde Passion. New York: LBM. ISBN 2-9153-4773-5. Endres, Gx�nter (2001). Concorde. St Paul, Minnesota: MBI Publishing Company. ISBN 0-7603-1195-1. Ferrar, Henry (ed.) (1980). The Concise Oxford French-English Dictionary. New York: Oxford University Press. ISBN 0-19-864157-5. McIntyre, Ian (1992). Dogfight: The Transatlantic Battle over Airbus. 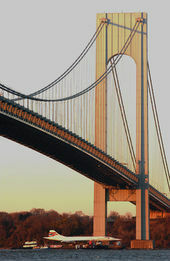 Westport, Connecticut: Praeger Publishers. ISBN 0275942783. Owen, Kenneth (2001). Concorde: Story of a Supersonic Pioneer. London: Science Museum. ISBN 9781900747424. http://books.google.com/?id=VzNUJlX7CXoC&printsec=frontcover&dq=Concorde:+story+of+a+supersonic+pioneer#v=onepage&q&f=false. Orlebar, Christopher (2004). The Concorde Story. Oxford, UK: Osprey Publishing. ISBN 1-85532-667-1. Schrader, Richard K (1989). Concorde: The Full Story of the Anglo-French SST. Kent, UK: Pictorial Histories Pub. Co.. ISBN 0-92952-116-1. Towey, Barrie (ed.) (2007). Jet Airliners of the World 1949-2007. Tunbridge Wells, Kent, UK: Air-Britain (Historians) Ltd. ISBN 0-85130-348-X.